The Hello Kitty franchise by Sanrio is probably the cutest thing to ever come out of Japan and with that said, the PlayStation 2 game is equally as cute. The story behind the game is relatively straight forward and when Block-O leaves his planet to conquer the universe, he accidentally lands on Earth. Here, he sees people throwing away boxes after giving each other gifts, and grows angry at the treatment he thinks is being accorded to fellow block-shaped items. He dispatches an army of blocks to take over Earth and help the downtrodden boxes. It’s up to Hello Kitty and her friends to “block” the Blockheads. 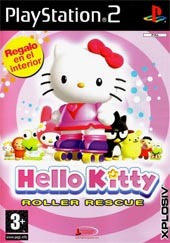 Hello Kitty Roller Rescue features Hello Kitty on roller skates, which is an unusual mode of transportation. It works fairly well and is a good match for the 3D environment in terms of fluidity and the look of the skating, but tends to be a slow kind of movement. At times, it feels like Hello Kitty is moving around in molasses. Hitting a button will give her a boost of speed, but it is very short-lived. The gameplay for the most part is easy, with the exception of the boss levels. 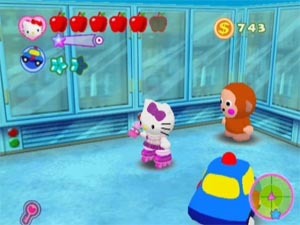 Hello Kitty has to rescue her friends in each level, and will need to solve some easy puzzles in order to do so. These puzzles are super easy, as the in-game hints are very plain as to what is needed for each task. Simple levers, bridges, movable boxes and unlockable doors are the main type of puzzle encountered. Action is the main focus of the game, but after about the fourth level, Hello Kitty has help in the form of a friend, who will aid her automatically in fighting. These friends can be levelled up, by Hello Kitty finding special items for them. Graphically, the game looks great and everything is vividly coloured and the Hello Kitty characters look just as bright and cheerful as always. However, the camera movement is distracting, as it’s just a little too “close-up” to the action to be comfortable, especially for those prone to motion sickness. Also, the camera tended to get stuck at points, and too many times Hello Kitty will be battling away in front of a tree or other obstacle, sight unseen. As with the graphics, Hello Kitty features a very "cute" sounding soundtrack that actually sounds like it comes from a Saturday morning Japanese anime cartoon. With an addictive musical score and all the screams of joy and pain from Hello Kitty and crew, one cannot but help enjoy this title. 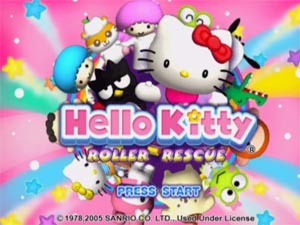 In conclusion, Hello Kitty Roller Rescue is a good children’s platformer, with an attractive combination of pleasing looks, easy tasks and collectibles. A few things hold it back from being a better game, such as the lack of mini-games, more interesting challenges and the awkward camera viewpoints. However, the presentation is nicely done and the ability to add clothes and weapons as they are unlocked is fun. This game is most likely to appeal to young girls under the age of 12.